Once the ore, which is a mix of valuable minerals and waste rock, has been brought to surface, it must be processed. Ore can be processed at the mine site or it may be shipped offsite for processing which happens in mills, smelters, and refineries. The first step in the treatment of ore is to reduce its size. This is accomplished by various stages of crushing which breaks down the rock into smaller more manageable sizes. 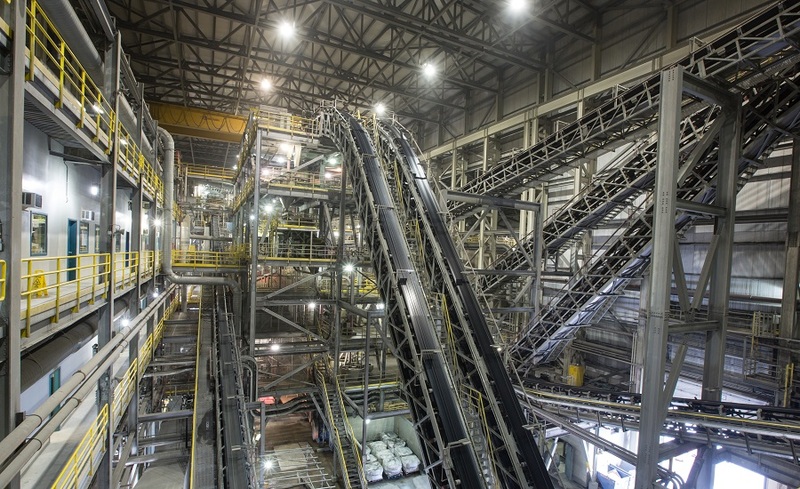 Conveyor belts carry the crushed ore to huge rotating steel drums, called grinding mills, where it is mixed with water and sometimes chemicals. Grinding breaks the smaller ore mineral grains free from the waste rock. The resulting product is wet, muddy slurry. Depending on the type of mineral being mined, the next steps vary somewhat. With gold and silver, the cheapest method for recovering is to separate the previous metals from the gangue by making use of their chemical and weight differences. If the minerals and ore can’t be separated by gravity, then chemicals such as cyanide are used that dissolve the minerals. Carbon leaching can also be used to collect the precious metals. Recovering base metals, such as copper, lead, zinc or nickel, is also quite different from diamonds or gold. The ground ore is fed into large tanks, or flotation cells, filled with a soapy chemical solution that is whipped into a froth through blowing air. Ore minerals stick to the bubbles and are carried to the top of the tank where a continuously-skimming blade collects the ore-laden froth. Waste rock or tailing is left behind. The wet ore is separated from the solution using filters, and then dried in preparation for shipment to a smelter. Base metal smelters are very expensive processing facilities that require a very large amount of energy and a large amount of concentrate. None exist, nor will likely be built in the near future, in the NWT. Gold concentrate, on the other hand, is produced in much smaller quantities than base metals concentrate. Thus, it can be smelted at the mine itself. Diamond ore processing does not require chemicals to separate the diamonds from the kimberlite host rock. Diamonds have unique properties of high density, hardness, and luminescence that enable their separation from the ores. In the process plant, diamond ore is combined with water and ferrosilicon (magnetic sand) and fed into cyclones which separate diamonds and indicator using density. In the recovery building, the diamonds are separated from the waste using X-rays to trigger a unique characteristic of diamonds – diamonds glow under this kind of light, and grease tables. Photo-electric sensors then direct strategically-placed air blasts to blow the diamonds off the conveyor belt into diamond collection receptacles. Wherever possible, chemical solutions are recycled to be used several times before being pumped into disposal areas, along with the pulverized waste rock. These areas, known as tailings ponds, are carefully designed to prevent any materials from escaping and polluting nearby rivers or lakes.